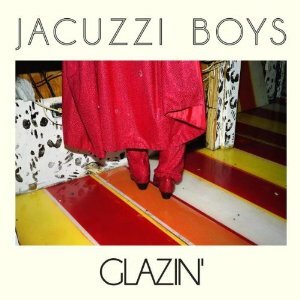 So here it is; Jacuzzi Boys’ sophomore full-length release, Glazin’. Upon first listen to this album, I’m searching for the meaning behind the intriguing title of this LP. Sounds pleasantly sweet, doesn’t it? Aside from the visual the title track provides of a super-sized donut melting over your head in the hot sun (“sugar in my hair, melting everywhere in the sunshine, watch the sun go down while all my face starts to crystallize”), I have no concrete suggestion as to what Jacuzzi Boys are getting at here. Upon further absorption of this track and the rest of the album, I’m starting to get the “glazin’” feeling, the mood, the swagger, the vibe. The adept and effective blend of vocals, guitar, and percussion (especially the party popping high hat taps) transports the listener to a carefree, beachy bar where one can freely confide in their familiar bartender about their favorite summer love, maybe standing up on the bar to share the anthem with fellow bar patrons as well. Download Jacuzzi Boys – Vapors MP3 HERE!